Much like yoni eggs and rose-quartz facial rollers, I used to consider eye cream a little bit of a novelty, a nice idea with minimal payoff. That is, until one morning, half-asleep, I mistook my cheap-o drugstore eye cream for daily moisturizer, applying a heaping finger-full to my entire face before I did my usual thing. I didn't think much of the small switch-up, until people started complimenting my skin and asking me what was "different" about me. That's when I caught on: the stuff's actually legit. Years have passed since that day, and countless expensive, ultimately useless eye gels, masks, and rollerballs have reverted me to my original cynicism. Not one of the eye-specific formulas I tried really did much of anything to plump or brighten the permanent cast of puffy blue-ish purple scaling from the inner corners of my eyes down the sides of my nose. But I recently got my hands on a little pink pot that's finally made me excited about eye cream again, just like the time I accidentally used it as moisturizer. Because let me tell you, if this stuff didn’t cost $149 for a 2ml jar, I’d be slathering it all over my entire face every damn day. You might call me a super-fan of MZ Skin's Soothe and Smooth Eye Collagen Activating Eye Complex, formulated by facial aesthetics doctor Maryam Zamani, MD, and turns out I'm in good company. Makeup artist Erica​ ​Sauer says, "It's an absolute staple for beautifully restored under-eyes, especially for models who need to keep their delicate skin protected from constant makeup application and removal." The magic of the eye cream might come from the formulation, made with Albazia bark extract, which helps strengthens capillaries (those pesky blue blood vessels), and a cocktail of moisture-locking and plumping hyaluronic acid and ceramides. It could be the fact that after I dab it on, my Glossier Stretch concealer glides on like a dream, and stays that way all day. Or maybe it's the makeup artist endorsement that makes me want to swim in the stuff. I mean, I'm not saying I'm a supermodel now — but I'm also not not saying that this eye cream makes me feel like one. 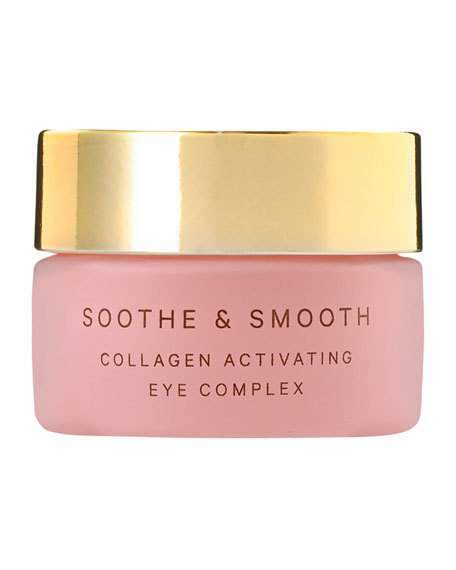 MZ Skin Soothe & Smooth Collagen Activating Eye Complex, $149, available at Net-a-Porter. A previous version of this story misstated that Gisele Bündchen uses and endorses MZ Eye Cream. The story has been updated to reflect the change.